Artwork of Idunn from The Binding Blade. The demon dragon that was feared by all mankind during the Scouring. Idunn (Japanese: イドゥン Idenn) is the primary antagonist and final boss of Fire Emblem: The Binding Blade. At one time, she was a Divine Dragon like Fae, before being turned into a Demon Dragon and having her soul destroyed by the warring dragon clans during The Scouring. Though dragons were formidable opponents during the Scouring, mankind had strength in both numbers and, compared to dragons, the ability to reproduce efficiently. Eventually the war began to go in favor of humanity, the warring dragon tribes appealed to the Divine Dragons, asking them for one of their own to become a Demon Dragon, which could produce artificial War Dragons to increase their dragons' numbers and turn the tide of war. The Divine Dragons, however, regarded the idea of War Dragons to be an abomination against nature and refused. The Divine Dragons then vanished from history. The Divine Dragons are implied to have escaped to Arcadia, of which there are still some residing there by the time of The Binding Blade, such as Fae, and Fire Emblem: The Blazing Blade depicts various dragon tribes, an Ice Dragon in particular, living in the village. Idunn, however, stayed behind because she feared the Divine Dragons would eventually get into conflict with the other dragons. She was captured by the warring dragon tribes and turned into a Demon Dragon, but she still refused to create the War Dragons. Because of her refusal, the dragons destroyed her soul in order to make her follow their commands. The War Dragons were born, and the war began to shift in favor of the dragons. However, when defeat was looming over humanity, they combined their greatest technology and magic to forge the Legendary Weapons, designed to battle dragons. The weapons were given to the Eight Legends, who used their power to fight Idunn's War Dragons. Mankind also used the calamity of Ending Winter, caused by the great power of the dragons and Legendary Weapons, to its benefit, leading to Idunn's defeat at the hands of Hartmut the Champion. The remaining dragons were either killed or banished to another universe lying beyond a magical portal located on Valor Isle. Instead of killing Idunn, however, Hartmut took pity on her and sealed her away with the Binding Blade. She remained bound for nearly a thousand years until King Zephiel of Bern released the seal. Having lost his faith in humanity due to years of abuse and an assassination attempt by his father, King Desmond, Zephiel wished to crush the world of humans and give it to the dragons, who he believed should have won the Scouring. Jahn, one of the last, if not the last, members of the Fire Dragon clan remaining in Elibe, approached Zephiel after Idunn's release and assisted him in realizing his goal. Under Zephiel's and Jahn's command, Bern moved to conquer the entirety of Elibe, but was stopped by the combined forces of Lycia and Etruria led by General Roy of Pherae. After Roy's defeat of Zephiel, if the player collected all the Legendary Weapons and the Binding Blade is intact, Roy will track down Jahn and Idunn. After Jahn is defeated, Roy faces Idunn, who has continued to follow her dead master's order to produce War Dragons to conquer the world. If the player defeats Idunn using the Binding Blade and Fae is still alive, the true ending will occur and Idunn will be spared by Roy (if not, Idunn will be killed by the falling rubble in the collapsing temple). She is brought to Arcadia, where the Divine Dragons restore her soul, though they are unsure as to whether she will ever return to normal, having been separated from it for so long. 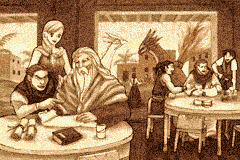 In the last scene of the Epilogue, Idunn is seen laughing with Fae, giving hope that she would eventually return to her previous self. Idunn is one of the characters added to the game in the A Father's Legacy update, and became available for summoning by players on March 8, 2019. Only one variation of Idunn is currently available in Heroes, based on her The Binding Blade incarnation. Idunn: Dark Priestess is only available at 5★ rarity. During the events of Fire Emblem: The Binding Blade Idunn is shown to have minimally functioning emotions, and follows Zephiel's orders with no objection. This is due to her soul being damaged by the other dragons that wished to use her power during the war with the humans, the Scouring. Before this, Idunn was a Divine Dragon, like the other Divine Dragons Idunn did not wish to participate in the war. Idunn faltered in her resolve to vanish, she did not want the Divine Dragons and the other dragon tribes to turn against each other. Idunn was unsure of causing the dragon tribes to conflict with each other, but she would also not serve the warring dragons, she refused to obey them, she seemingly did not wish to war with the humans. Idunn does not have any battle quotes. Idunn is currently featured on one card in Fire Emblem Cipher. "As Your Majesty commands... The world will be freed."" ""For age after age I lay sleeping... But now I am awoken. For that was the will of His Majesty." Divine Dragon Fallen to the Demonic: [Activate] [ ] If you have more Orbs than your opponent, reveal the topmost card of your deck, and play it in the Bond Area. Dragon-Birthing Dragon: [Activate] [Once per turn] [ ] Choose 1 card with a Deployment Cost of 4 or lower from your hand, and deploy it. For more detailed strategic information on these cards, see their TCG wiki article on Idunn . Idunn is one of three characters in the Fire Emblem series to have complete heterochromia, Idunn's irises have two different colors, green and pink. The other two characters that have heterochromia are Ranulf and Peri. While Idunn and Peri both have heterochromia, they both have the same eye colors, as mentioned earlier, pink and green. English Idunn In Norse mythology, Iðunn is the goddess of eternal youth and guardian of the sacred apples that return the gods to youth once they became old. • Used in the DTN translation patch. • Common anglicization of Iðunn. Used in the gringe translation patch revision. Japanese イドゥン Officially romanized as Idenn. As above. Idunn's apperance in The Binding Blade's introduction. Artwork of Idunn: Dark Priestess from Heroes. This page was last edited on 30 March 2019, at 02:11.